The scenes may play well on Christmas cards, but on the barely visible streets powdered by fresh snowfall, tempers are beginning to fray. Quite simply, after a week of constant snow and temperatures dipping below -10C in brilliant winter sun, many of those in snow-bound communities across north Wales have had enough. Perhaps it is the tiredness of constantly digging cars out of the latest chilly white shower? The trudge miles along treacherous lanes to reach shops; the wait for mail that doesn't come, or the worry about heating oil as the tank levels slump towards empty? "I don't fancy going round on Christmas Day with the wagon - but I may have to," admitted Haydn Williams, from Anglesey Oil, one of the companies struggling against the elements to get that much needed heating oil out to homes. "Most of the estates places like Benllech are all on hills and I was stuck last week for two and half hours. "That just makes the backlog even worse. I've got people who have ordered since a week Monday. "Everybody wants it before the big day don't they?" 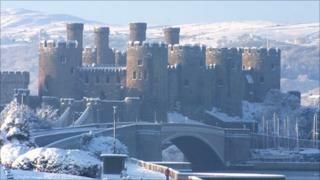 The latest showers have seen up to a foot of snow fall in parts of north-west Wales. Anglesey, Conwy and Gwynedd have taken the brunt of Tuesday night's blizzards. At one point, the Royal Mail was considering sending its vans out to village post offices in parts of Gwynedd, rather than door-to-door deliveries, concerned that the Christmas post simply couldn't get through. But with council staff working around the clock, the main routes across the county remained open on Wednesday. And while many have made that extra effort to get through the white-out, some have taken advantage of cold spell and misfortune of others. On the approach to the Conwy valley village of Rowen, three abandoned cars holed up in a snowy lay-by have doors forced open and windows smashed. Thieves have made off with the audio equipment inside - a Christmas surprise that the owners could do without. But for every bah-humbug moment - the human spirit of these north Wales communities thaws the frosty atmosphere, and brings some festive cheer. Gwyn Jones runs a car body repair shop at Gaerwen on Anglesey. In the last week he has done more than 1,000 miles ferrying doctors and nurses to their calls in his 4x4 - whatever the weather. "You sit in awe listening to them - and their dedication to their job," he said. "It's not just the work, it's the care that they have for their patients. It's unbelievable - it's been amazing." He is modest about his own role, thanking his own staff for making sure the garage runs smoothly while he fits in his own mercy missions. "I'll keep doing it until it finishes," he insisted. "I'll do it over Christmas, Christmas Day, Boxing Day to help them out."